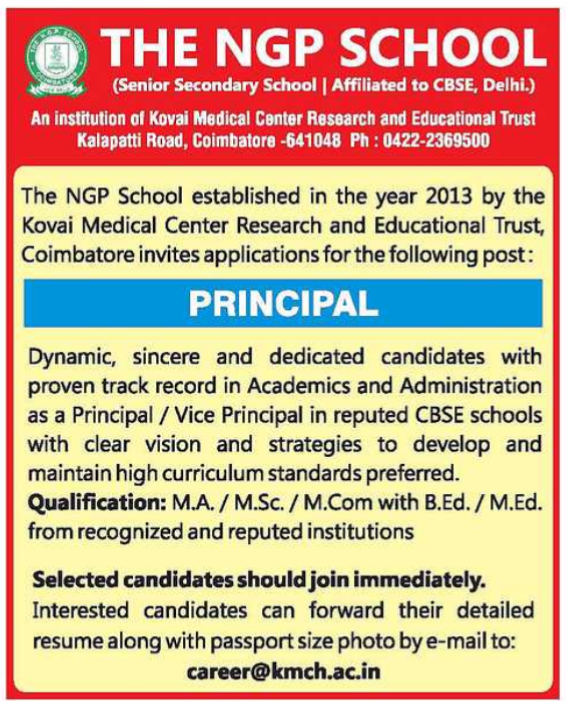 The NGP School, Coimbatore has advertised in THE HINDU newspaper for recruitment of Principal jobs vacancies. Interested and eligible job aspirants are requested to apply immediately. Check out further more details below. 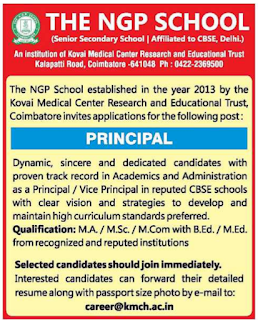 About School: THE NGP SCHOOL is a Co-educational Institution. It provides an opening to develop headship qualities of both boys and girls. Our school aims to build up the children as a whole rendering excellence in education through well educated and trained governance. Apart from adhering to the curriculum set by the Board, our Institution formulates special programs based on specific requirements. We aim to generate high profile children who can headstart successful careers throughout the world.